GrandPa, Taylor, did sit at the piano and hit out some tune, the same one each time…but that was it. 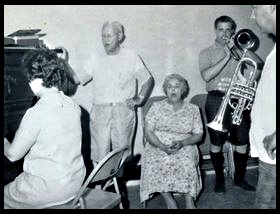 Wally, on the other hand could bring out many tunes, usually hymns or choruses and in the picture was playing the trombone, Bob on the violin and TAD on the Trumpet and Grammy singing by Aunt Betty on the piano. Occasionally, I can, by ear, hit a tune. Will Kindberg was playing the trumpet in the picture. When I arrived at home one day, Mom Duncan, Grammy, had the piano dismantled in various parts of the living room. Ya, she said she was trying to repair it. Miracle of miracles it got reassembled and probably in tune. Yep, for the great grandpa of Mom, she got her engineering genes/degree.